The Book of Common Prayer is the common title of a number of prayer books of the Church of England and of other Anglican churches. 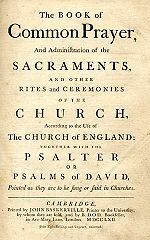 A major revision was published in 1662 (Church of England 1662). That edition has remained the official prayer book of the Church of England, although in the 21st century, an alternative book called Common Worship has largely displaced the Book of Common Prayer at the main Sunday worship service of most English parish churches. Thanks to the era of internet and electronics it is no longer necessary to feverishly browse through and old dusty book to get to the right pages — although dusty can have its charm too — but you can easily find it on the web neatly arranged per day, divided between morning, evening and night-prayer. Just click on the link and you’re ready to go! On the site mentioned above you can choose between the old The Book of Common Prayer (1662)-text that has a literary beauty of its own and the Common Worship: Daily Prayer-version that is more accessible to our postmodern race. intercession: for the day and its tasks; the world and its needs; the Church and her life. The evening prayer rite is quite similar in length and composition but consists of some different elements. The night rite is quite short in comparison. It is also called the ancient office of the Compline. It is above all a service of quietness before rest at the end of the day. A period of silence for reflection on the past day may follow. The following or other suitable hymn may be sung. Your watch around us while we sleep. That we no sinful thought may know. Our souls are raised to life from death. Intercessions and thanksgivings may be offered here. for you alone, Lord, make us dwell in safety. for the night is at hand and the day is now past. so do we look for you, O Christ. All of the official Common Worship publications are being published by Church House Publishing. How do I use the Daily Prayers in my devotional time? Since I already listen to the Bible every day for 20 minutes @ Daily Audio Bible, I skip most of the Scripture readings and Psalms and stick to the beautiful prayers as mentioned above. But if you haven’t yet established a daily Bible reading routine then the Book of Common prayer can be just perfect for you to immerse yourself in Scripture and pray the prayers of the ages daily. I encourage you all to give it a go! Feel free to ask me any questions or comment on this post below, or follow me on Twitter.